Arcimboldo also spelled ARCIMBOLDI Italian Mannerist painter whose grotesque compositions of fruits, vegetables, animals, books, and other objects were arranged to resemble human portraits. In the 20th century these double images were greatly admired by Salvador Dali and other Surrealist painters. Beginning his career as a designer of stainedglass windows for the Milan Cathedral, Arcimboldo moved to Prague, where he became one of the favourite court painters to the Habsburg rulers Maximilian II and Rudolph II. He also painted settings for the court theatre there and developed an expertise for illusionistic trickery. His paintings contained allegorical meanings, puns, and jokes that were appreciated by his contemporaries but lost upon audiences of a later date. His eccentric vision is epitomized in his portraits"Summer" and "Winter" (Kunsthistorisches Museum, Vienna). "retention of urine and kidney stones" as the cause of his death. It also mentions that he had not died from the plague. His father, who worked as a painter for Milan Cathedral, was called Biagio Arcimboldo or Arcimboldi. It is still uncertain which version is the correct one, because Giuseppe himself used to write it differently. Sometimes he would sign his name as Arcimboldo, then again Arcimboldi or Arcimboldus. Sometimes he would put Giuseppe, then Josephus, Joseph or Josepho. I have decided to use the name Arcimboldo, which has been common in France and everywhere else, though not in Italy. Like all Italian names with the ending -baldo or -boldo, Arcimboldo is Southern Germanic in origin. The history of the Arcimboldo family was recorded by Father F. Paolo Morigia, who faithfully wrote down everything the artist told him. And according to Father Morigia it goes back as far as Charlemagne, in whose services there was said to have been a certain Southern German nobleman by the name of Saitfrid Arcimboldi. Of his sixteen children three were said to have excelled so much that they were also ennobled. One of these three subsequently emigrated to Italy, where he established the Italian line of the Arcimboldi family. This story is undoubtedly a mixture of history and legend, but the following words of Morigia's seem to be more securely grounded in facts: "Everything I have been saying about the Arcimboldis comes from Mr. Giuseppe Arcimboldi, a trustworthy gentleman with an impeccable lifestyle, who has served two German Emperors (which will be expounded further), and he has copied these details about the ancestry and origins of the Arcimboldi family from an ancient parchment in the German language which was read to him by the physician of the Emperor Maximilian, and he declares furthermore that he has visited two places which are called Arcimboldi. He also says that in the city of Augsburg, near its biggest church, there is a big cemetery with a large chapel, and on entering through the gate one can see an ancient tombstone of red marble bearing the coat of arms of the Arcimboldi family with its characteristic letters. Likewise he firmly asserts that, in the city of Regensburg in the large cathedral churchyard, he saw a big and very ancient tomb with the coat of arms of the Arcimboldis and its typical letters etched into it, and that there are many Arcimboldis all over Germany." Thus spoke Morigia. And it is indeed true that Arcimboldo was commissioned by the Emperor Rudolph II to make a journey to Kempten, so it is quite plausible that he went via Augsburg and Regensburg. In his Nobilita di Milano Father Morigia gives a very detailed account of the history of the noble family of Arcimboldo, and so we learn that Guido Antonio Arcimboldo, Giuseppe's great-great-grandfather, was elected Archbishop of Milan as a widower in 1489, thus becoming the successor of his deceased brother Giovanni. Guido Antonio's son Filippo was the father of Pace, Giuseppe's grandfather. Biagio, Giuseppe's father, was Pace's illegitimate son. Guido Antonio's brother Giovanni, who died in 1489, was the grandfather of Gianangelo Arcimboldo, who was born in 1487 and held the position of Archbishop of Milan from 1550 until his death in 1555. This great-uncle must have been quite influential in Giuseppe's life when he was young. He introduced him to artists, scholars, writers and important humanists who used to come to his house. These contacts probably helped to lay the foundation for that turning point which was to take place in Arcimboldo's art and which was regarded by many as somewhat eccentric. It is likely that Giuseppe also knew the German artists who were working on Milan Cathedral or who were producing tapestries for the Medicis. Apart from that we know very little about young Giuseppe's development. However, considering that he became quite a famous and erudite artist, we have reason to assume that the foundation must have been laid in his youth. 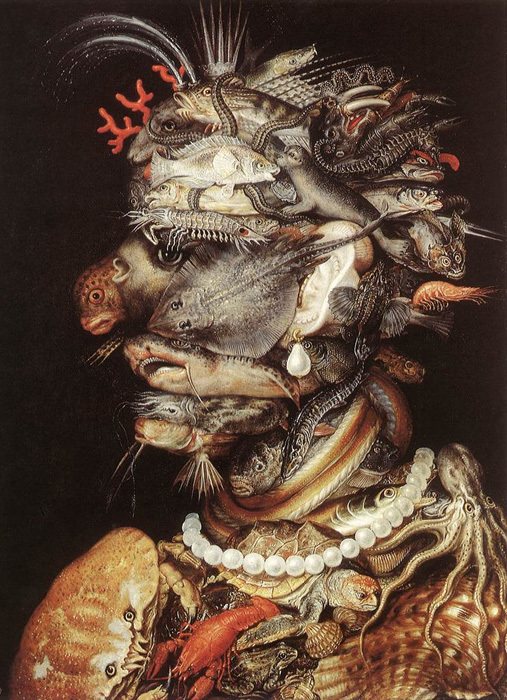 One of Arcimboldo's early contacts is mentioned by Benno Geiger. Giuseppe's father was a friend of the painter Bernardino Luini, a pupil of Leonardo da Vinci's. However, Giuseppe had no direct relationship with either of the two: Leonardo had left Milan in 1516 and then gone to France, where he died in 1519; and Bernardino Luini died as early as 1532, when Arcimboldo was only five years old. Nevertheless, a link with Leonardo via Luini did exist. When Leonardo left Milan, he handed his notes and sketch books to Luini, and it was through Luini's son that Giuseppe saw them. We can imagine that a lot of it must have left a deep impression on the young artist. Because of the expulsion of Duke Ludovico (il Moro) from Milan, as well as a plague epidemic at the beginning of the 16th century, Milan had lost its leading position in the world of art. However, there were still links with other cities and artists in the whole of Italy, as well as Germany, the Netherlands and France. We can safely assume that Arcimboldo cultivated his contacts not only with painters, but also with philosophers and other scholars. In 1549, at the age of 22, Giuseppe Arcimboldo made his debut as an artist. The records of Milan Cathedral tell us that, together with his father, he was paid for designing several stained glass windows. In 1551 he painted five coats of arms for Ferdinand of Bohemia; the duke was passing through Milan and was probably told about Arcimboldo. This was before he became Emperor Ferdinand I. 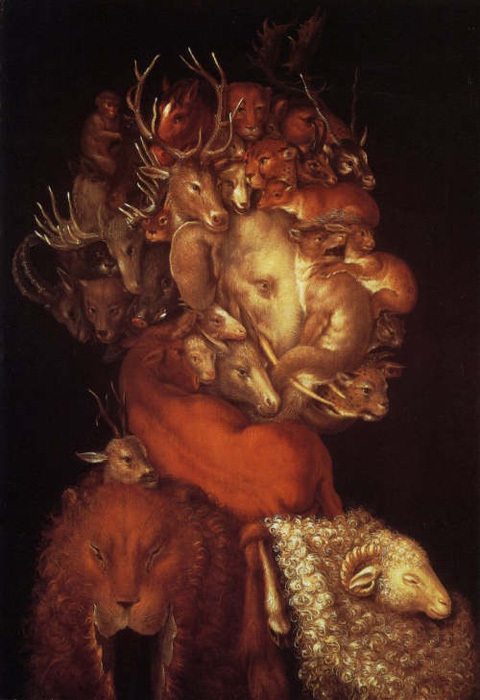 It is possible that Arcimboldo was already more famous than we are aware. This conclusion is in fact justified when we read an account by Paolo Morigia, a friend and contemporary of Arcimboldo's. When the painter went to Prague in 1562, Paolo Morigia assessed his fame in these words: "This is a painter with a rare talent, who is also extremely knowledgeable in other disciplines; and having proved his worth both as an artist and as a bizarre painter, not only in his own country but also abroad, he has been given the highest praise, in that word of his fame has reached the Emperor's court in Germany." Arcimboldo's Spring is completely framed by garlands which were painted in a style distinctly different from that of the figure. A. Pieyre de Mandiargues was probably right when he wrote that the garlands must have been added later. When we look at the painting from a distance, we notice that the face is that of a young woman with a gentle smile. A close look, however, reveals that her skin, hair and clothes are only an illusion and that the woman is in fact composed of the petals and stalks of spring flowers, which are rendered in minute detail. Her skin consists of blossoms ranging from white to pink, her hair is made up of a magnificent array of colourful flowers, and her dress is a collection of green plants. Her nose is the bud of a lily, her ear a tulip, and her eye is a couple of black nightshades and their blossom. White flowers are arranged to form a ruff, which separates face from dress. From 1551 onwards only Giuseppe is mentioned in the cathedral documents, probably because that was the time when his father died. Until 1558 there were regular entries about a whole series of cathedral assignments. But the only design which has been preserved and identified is that of a number of stained glass windows to illustrate the history of St. Catherine of Alexandria in 48 parts. This seems to be all that is left of the work of the two Arcimboldos at Milan Cathedral. Geiger points out that "the stories concerning St. Catherine, which were started by both painters together and finished by the son, did not go beyond the confines of the typical style of the time, the style in which the lives of saints were usually depicted. These and other stained glass windows clearly show the influence of Gaudenzio Ferrari more than anybody else's." But Geiger also believes that there are "Arcimboldesque" elements in some of the windows, so maybe there are also some in at least one of the examples shown in this book. Also, it is quite possible that among the large number of unidentified stained glass windows there are quite a few which were designed by Arcimboldo. After all, the number of designs for which he was paid far exceeds that of his St. Catherine windows. According to Geiger, these windows contain some clear elements of the style he was to adopt later. In 1559, Arcimboldo is mentioned in the documents of Milan Cathedral for the last time. The clue to this is an entry in the account book of Como Cathedral. in the account book of that year. 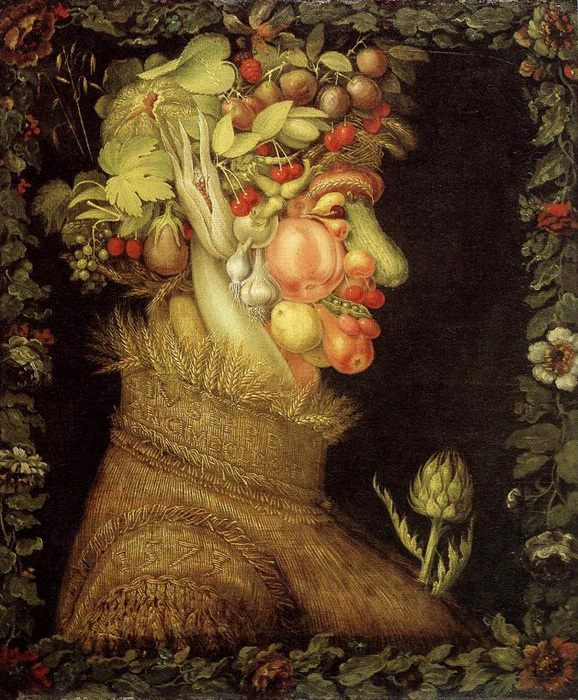 So this first Gobelin tapestry was undoubtedly designed by Arcimboldo. And there is no reason why we should doubt the authenticity of seven others. They are all equal in size and colour scheme. A simple comparison confirms their similarity: "The sumptuously ornamental paintings full of fruit and blossom, flower bunches and garlands, angels and little cherubs, as well as an abundance of scroll-shaped ornaments which do not leave space for anything else" - all these elements show clearly the hand of one single artist. Also, they show even more clearly than his stained glass windows what kind of style he was to adopt later. The ornamental sumptuousness of his pictures as well as his depiction of various scenes can be called "Arcimboldesque". 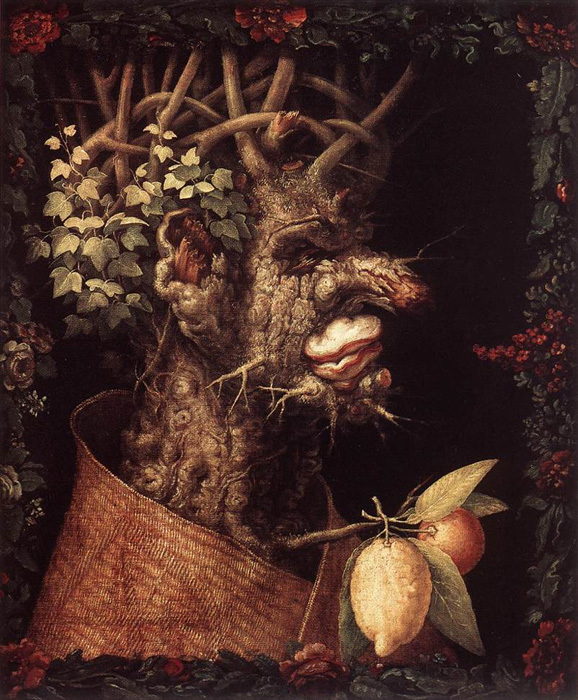 Geiger believes that Arcimboldo might have been influenced by the two Flemings Johannes and Ludwig Karcher, who used to make the Gobelin tapestries to his designs, or, alternatively, that "his Germanic heritage was aroused" in the artist. Like Spring, this picture belongs to the complete series of the Four Seasons which is now in the Musee National du Louvre in Paris. What is said about the garlands around the first picture also applies to this one. Both Summer and Spring are human heads in profile. Summer consists entirely of different kinds of summer fruit and vegetables. The glowing colours of the head stand out in bold relief against the dark background. On the broad, stiff collar he has delicately woven the words "Giuseppe Arcimboldo - F." The F stands for fecit ("he has done it"). This is the painter's way of authenticating his work of art. On the shoulder there is the date of the painting: 1573. In 1562 Giuseppe gave in to the repeated requests of Emperor Ferdinand I and went to Prague. Benno Geiger's source study confirms that Arcimboldo must have continued to be famous even after the Emperor had asked him to be the court artist. To give an idea of the relationship between Arcimboldo and Ferdinand I as well as his successors, the Emperors Maximilian II and Rudolph II, I shall quote Morigia again, who says in his Historia dell'Antichitd di Milano of 1592: "In 1562 he (Arcimboldo) left his country and joined the Emperor's court, where he was liked and treated well (by the Emperor) and received with great kindness, and the Emperor gave him a good salary worthy of his merits and also showed his affection in many other ways. And so our Arcimboldo lived a very fulfilling and honourable life at the Imperial court, not only for him (Ferdinand), but also the entire court, not only with his paintings, but also many other works of art and pieces of woodwork for occasions such as tournaments, games, weddings, coronations, and especially when Archduke Charles of Austria took a wife. This noble and inspired man fashioned a great number of rare and delicate works of art which caused considerable amazement among all the illustrious noblemen who used to congregate there, and his lord and master (Ferdinand) was very pleased with him. It is also worth mentioning that when Maximilian succeeded his father on the Imperial throne, Arcimboldo was never refused permission to see the Emperor at any hour of the day, for he was counted among those who were in particular favour with the Emperor, and indeed the whole of the Austrian court befriended him and loved him for his art as well as his impeccable disposition. When Maximilian died, he was succeeded by his son Rudolph, who extended the same favour and love to Arcimboldo as his father had done. When, after twenty-six years of service to these two great monarchs and to the whole House of Austria, this noble and honourable Giuseppe asked the Emperor several times over a period of two years if he might very kindly be granted leave to return to his home country in order to enjoy his old age there, he was finally granted this favour, albeit very reluctantly, for His Imperial Majesty had become so fond of him that he was loath to deprive himself of his presence." From 1562 onwards we have a clearer picture of Giuseppe Arcimboldo's life, thanks especially to the entries in the Archiv fur Kunde osterreichischer Geschichtsquellen ("Archive of Austrian Historical Sources") and the Urkunden und Regesten aus dem Jahrbuch des Allerhochsten Kaiserhauses ("Documents and Records from the Almanac of the Most High Imperial House"). During the two years when Arcimboldo served Ferdinand I he painted several portraits of the Imperial family as well as the first series of his Four Seasons. Two of these, Summer and Winter, are in the Kunsthistorisches Museum in Vienna. Spring can be seen in the Real Academia de Bellas Artes de San Fernando in Madrid, and Autumn has been lost. The notes on the previous two paintings also apply to Autumn, which was painted in the same year. A broken old tub is held together by some wicker branches in a somewhat makeshift arrangement, and a head protrudes from it. It is the head of a rather rough sort of fellow, and is made up of autumn produce. His bulbous nose is a juicy pear, his healthy-looking cheek is a ripe apple, his chin is a pomegranate and his ear is a large mushroom, which could be a russula. It seems appropriate that the ear-ring should be an over-ripe, burst fig. 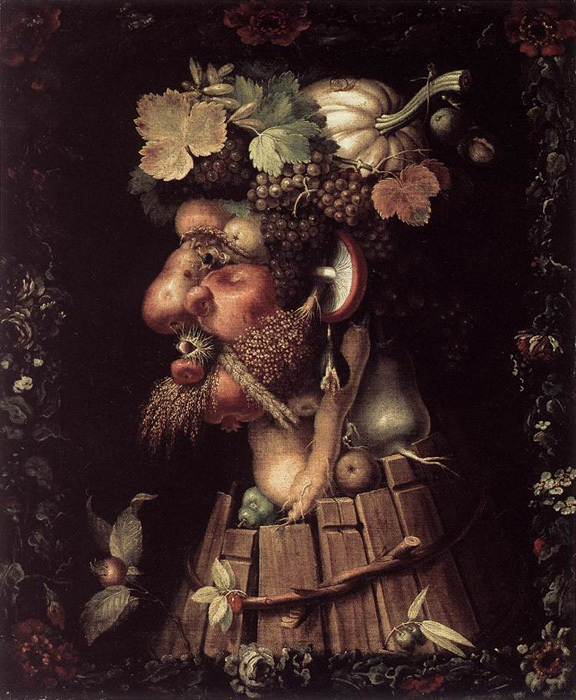 His head is crowned with red and white grapes, reddish vine-leaves and a gigantic squash, thus reminding us of Arcimboldo's earlier depictions of Bacchus. The sumptuousness of the fruit is an indication of the fertility of autumn, and the sharp tongue which comes through the prickly lips seems to signal Autumn's joyful anticipation of culinary delights. The artistic concept of these pictures of 1563 was unique and laid the foundation of Arcimboldo's success as a painter. The documents of the time bear witness to the fact that monarchs and his contemporaries in general were quite enthusiastic about his art. We do not know why there was this sudden turning point. As I pointed out above, Geiger believes that there were elements of it in his earlier paintings. And during his time at the Imperial court, these tendencies were undoubtedly reinforced by his acquaintance with pictures by Bosch, Brueghel, Cranach, Grien and Altdorfer. When Ferdinand I died in 1564 and was succeeded by Emperor Maximilian II, Arcimboldo continued as his court artist, with a monthly salary of twenty guilders. On special occasions the Emperor sometimes gave him a special supplement. It could be that he particularly liked a certain painting or that he gave him money for a special journey, such as a trip to Italy in 1566, which he sponsored with a hundred guilders. There is little doubt that a large number of pictures must have been painted between 1564 and 1576, but only very few of them are known to us. We do know that in 1566 Arcimboldo painted the Four Elements. Two of them, Water and Fire, are now in the Kunsthistorisches Museum in Vienna, whereas the other two, Earth and Air, have still not been located. Research has shown that Arcimboldo also painted the following pictures during the reign of Maximilian II: The Lawyer (1566), another series of the Four Seasons in 1572, an Autumn and a Winter, two series of Four Seasons in 1573, and in 1574 The Cook and The Wine Steward. The last two pictures are lost. But apart from painting, Arcimboldo also had other duties at the Imperial court. As he was a man of many talents, he also served the Emperor as an architect, stage designer, engineer, water engineer and art specialist. Because of his extensive knowledge he was able to exert his influence on Maximilian II. According to Lomazzo, Maximilian valued Arcimboldo's views so much that he not only listened to his judgement but also adapted his own taste to that of the artist. With Arcimboldo's help he extended his art and curio cabinets, thus creating the nucleus of a museum. Later they became Rudolph II's famous Art and Wonder Chambers, which will be mentioned in more detail later. It was customary among Renaissance monarchs to hold tournaments and feasts. These were always occasions of enormous pomp at the European courts. Everyone who had a high rank or a title came to these festivities: the aristocracy, church dignitaries, academics, artists and other ladies and gentlemen of high social standing. The monarch was always at the centre of the feast. He was the hero and the victor. For this reason, a tournament and a triumphal entry were always part of the show. The hero was always victorious in a tournament and returned home in a triumphal procession. The characters who took part were taken from ancient history or mythology. There were also references to the political conditions of the time, with the intention of glorifying the monarch and strengthening his political power. The common people were always thrilled by such a spectacle, which served its purpose of making them believe that everything was alright with their world and of diverting their attention from their misery. Winter is the final picture in the series of the Four Seasons which Arcimboldo painted in 1573. Although only Summer was signed by the artist, there are so many similarities between the pictures that there can be no doubt about the authenticity of the other three paintings. Winter is depicted as an ancient tree stump, which has almost died, with cracked bark, partly detached from the tree. It is easy to make out a pathetic old man whose nose is peeling and whose swollen, toothless mouth - a mushroom - sits crookedly on a chin full of warts. His face is covered with a stubbly beard and is full of scars and scabs. His eye seems to be hiding in a deep crack in the bark, and what we recognize as an ear is nothing but the remainder of a broken-off branch. A thick straw mat protects the old man from the cold. However, Arcimboldo does not see winter just as the cold season; his picture also contains an element of comfort. Hanging from a broken branch there are an orange and a lemon: with their glowing colours they introduce a glimmer of sunshine and warmth into the cheerless atmosphere. The green ivy growing from the back of the old man's head, as well as the tangle of branches resembling a crown, reinforce the feeling of hope that winter will not last for ever. If we take a closer look at the straw mat that envelops Winter like a cloak, we can make out a coat of arms. Arcimboldo often received commissions from the Emperor to paint the Four Seasons, and this was how he sometimes indicated the recipient of the picture. The order of the Seasons is full of symbolical symmetry. the other right and expressing a special relationship between the seasons they symbolize. Air, like the Four Seasons and the other three elements, has been depicted in the form of a human head in profile. 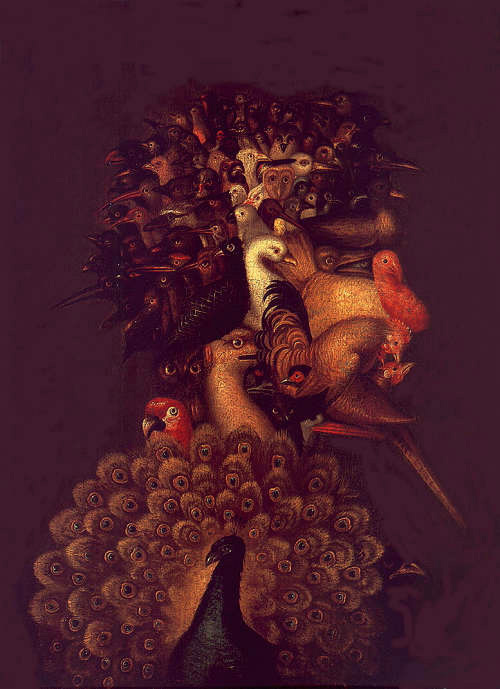 To express his ideas on the nature of air, Arcimboldo has populated this picture with a large number of birds. Most of them have only their heads visible and can hardly be identified, whereas others can be recognized immediately. The goose, for example, is quite easy to make out, and together with the tail feathers of a rooster gives a vague impression of an ear. The turkey with its swelled breast is the nose, and a pheasant, hiding partly under the wings of the rooster, provides a goatee beard with his tail feathers, thus decorating the chin of the figure. The little bird whose eye serves as the pupil of the human head remains a mystery, however, while the upper and lower eye-lid of the head is formed by the open beak of a duck. Arcimboldo's Four Elements contain some obvious references to the House of Hapsburg, such as the peacock and the eagle, which are both symbols of the dynasty. Arcimboldo became the most prominent organizer of such festivities. The imagination he showed in designing new costumes, inventing new forms of entertainment, bizarre figures and grotesque masques was simply inexhaustible. One of his festive processions included horses disguised as dragons and a real elephant. As Andreas Beyer points out, the sixteenth century saw a considerable increase in tournaments and festivals under the influence of classical humanism. "Florence, which was the centre of the philosophical revival, also became the most significant focal point for festive ceremonies." For the House of Hapsburg these festivities were of particular importance, because the area over which they ruled covered a large number of different nationalities, and such ceremonies gave the Emperor an opportunity to demonstrate the political power of his dynasty. The games usually consisted of three parts. First, there was the joust or tilting, in which two knights on horseback, separated by a fence, attempted to throw each other from their saddles with lances; then there was the free tournament, where the knights had to engage in hand-to-hand combat; and finally the so-called foot fight, where they had to attack each other with different kinds of weapons across a fence. The Records from the Almanac of the Most High Imperial House has the following entry for 28 July, 1574: Joseph Arcimboldo, Artist and Painter to the Roman Imperial Court, hath received 65 Rhenish Guilders for sundry work and painting which he hath wrought for the Elector of Saxony at the behest of Emperor Maximilian II. However, most of his pictures seem to have been lost. In 1575 Arcimboldo made several paintings for the private chambers of the Emperor and was paid a commission of 75 thalers. In the same year his illegitimate son Benedict was given official recognition by Maximilian II. And in 1576, Arcimboldo was paid 200 guilders as a special and final gift from the Emperor. We do not know of any other works. Like his two predecessors, Emperor Rudolph II also took Arcimboldo into his service. The eleven years which the artist spent with Rudolph II were probably the peak of his career. The Emperor was extremely fond of Arcimboldo and showed great appreciation for him. A peculiar mixture of irrational and scientific thought prevailed at Rudolph's court and was somehow reflected in Arcimboldo's pictures. There is an inscription in the lower right-hand corner of the gunbarrel which reads: "Josephus Arcimboldus Menensis. F" The date and the title are on the other side of the painting: 1566 Ignis". 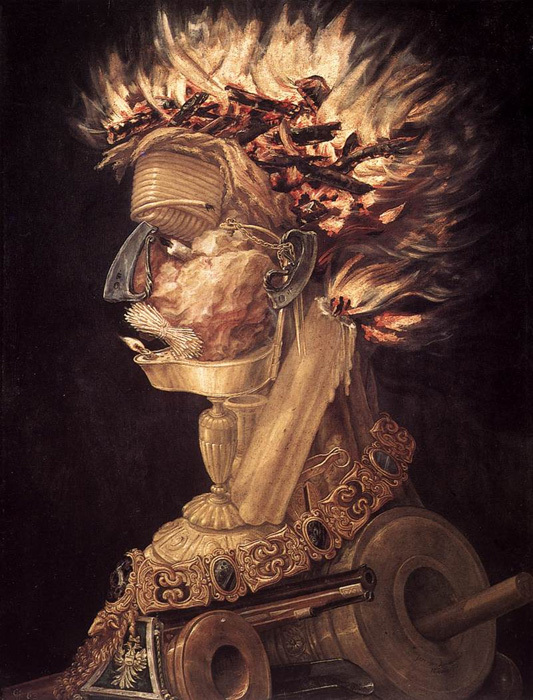 In this allegory Arcimboldo depicted several different types of fire, ranging from the small light of an oil-lamp or a candle to the tremendous power of cannons and guns. A flame can be kindled by striking the two pieces of steel (the nose and ear) against the flint which decorates the Golden Fleece. This will light the little oil-lamp (the chin of the figure), the bundle of spills (the moustache), the rolled-up taper candle (the forehead complete with wrinkles) and finally the pile of firewood, whose flames surround the head like a crown. There is hardly any other work of Arcim-boldo's which is more explicit in its references to the Hapsburgs. The neck is separated from the body by the chain of the Golden Fleece, which was one of the most important orders of the time. Duke Philip of Burgundy gave it to the Hapsburgs on the day of his wedding in 1429. Like many others, he became one of the Hapsburgs through marriage. What is even more significant is the presence of the double eagle, the symbol of the Holy Roman Empire of which the Hapsburgs were emperors at the time of Arcimboldo. Finally there are the gun and the cannons. These may well have served the purpose of emphasizing the great military power of the Hapsburg rulers, then at war with Turkey. Rudolph II was an eccentric. Weak, depressive and introverted, he preferred to avoid problems. He was not a warlike character, but always tried to find a compromise between the feuding Catholics and Protestants. He loved the fine arts, especially painting and sculpture, and took an interest in every academic discipline. Many scholars came to his court, including Tycho de Brahe and Kepler. There were astrologers who studied the course of the stars, alchemists who tried to produce gold, and others who attempted to prove that a circle could be reduced to a square or to construct a machine that was continually in motion, a so-called perpetuum mobile. His museum contained the works of famous painters, and artists from all over Europe used to work for him. All this meant that Prague had now become a major European cultural centre. But, Rudolph IPs interest lay mainly in his Art and Wonder Chambers. It contained everything that was regarded as exotic at that time, all sorts of unusual objects and animals. Benno Geiger gives some examples in his book on Arcimboldo: stuffed birds (from the world as it was known then), gigantic mussels, sword- and sawfish, precious stones, demons imprisoned in blocks of glass, mummies, objects from the newly discovered continent of America, precious things from India and a whole zoo of exotic animals. Everywhere the Emperor had his agents whose job it was to search for the extraordinary. And we know from two sources that Arcimboldo travelled to a place called Kempten in Southern Germany, where he bought a number of objets d'art, as well as exotic birds and animals. There had in fact been Art and Wonder Chambers for a long time. Maximilian II and Rudolph II kept extending them, and they provided exactly the right environment for Arcimboldo to thrive as an artist. It was in these chambers that he studied every detail of the animals and plants which he used for his paintings. (Incidentally, Rudolph II was a great gardening enthusiast.) All we know about Arcimboldo's activities as an artist at the Imperial court is that he painted The Four Seasons twice in 1577, that he dedicated a red leather folio containing 150 pen-and-ink drawings to the Emperor in 1585, and that he organized a number of festive processions and tournaments in the same year. We have no knowledge of any further pictures which he might have painted at the court in Prague after 1585. Documents tell us that, in 1580, Rudolph II reconfirmed the aristocratic status of the Arcimboldo family and that he granted the artist the privilege of upgrading his coat of arms. In 1587, after eleven years of service and a number of urgent requests, Arcimboldo finally received permission from Rudolph II to return to his native Milan. For his "long, faithful and conscientious service" he was rewarded with 1500 Rhenish guilders. And so he went back in the same year, but honoured the Emperor's request to continue working for him even though he was no longer in his service. In 1591 he painted two of his most famous pictures, Flora the Nymph and Vertumnus, which he sent to Prague. There are two versions of Flora, and the first one has probably been lost, but - according to Mandiargues - the second one is no worse than the first. Rudolph II must have been delighted with these paintings, because he awarded Arcimboldo one of his highest orders in 1592. A year later, on 11 July 1593, Giuseppe Arcimboldo died. Benno Geiger thought that this painting depicted a hunter. Nowadays, however, it is generally acknowledged to be an allegory of Earth. Comanini's Figino describes this picture so vividly that is seems worth quoting the passage from Geiger's book: "The forehead contains all these animals: an Indian gazelle, a fallow doe, a leopard, a dog, a fallow buck, a red deer, and the 'big animal'. The ibex, an animal which lives in the Tyrolean mountains, has been inserted in the back of the neck, together with the rhinoceros, the mule, the monkey, the bear and the wild boar. Above the forehead are the camel, the lion and the horse. And the nice thing is that all the animals with antlers have arranged their weapons around the forehead, thus forming a king's crown: that was an amazingly clever idea, and it decorates the head very nicely, too. The area behind the cheek (the head being in profile) is formed by an elephant whose ear is large enough to be the ear of the whole figure. A donkey underneath the elephant fills out the lower jaw. For the front portion of the cheek a wolf was forced to render its service, its mouth wide open and about to snap at a mouse: its open mouth is the eye, and the mouse the pupil of the eye. The tail and the leg of the mouse form a moustache just above the upper lip. On the forehead, sitting among the other animals, there is a fox with its tail curled up, which forms the eyebrow. There is a hare on the wolfs shoulder, forming the nose, and a cat's head which is the upper lip. Instead of a chin there is a tiger, held up by the elephant's trunk. The trunk is rolled up and forms the lower lip of the figure's mouth. A lizard can be seen coming out of the open mouth. The curvature of the entire neck is formed by a recumbent ox, together with a fawn." There is an abundance of allegorical and symbolical allusions which Arcimboldo, as it were, wrote into his paintings and series of paintings. His series of Elements and Seasons share several features, including the number four, and Arcimboldo's colleague Fonteo revealed some further correspondences in a poem. Fonteo sees the connection between the Elements and the Seasons partly in terms of common features or pairs of features - cold/ warm and wet/dry - which can be combined in four different ways so that the following correspondences can be established: "Summer is hot and dry, like Fire. Winter is cold and wet, like Water. Air and Spring are both hot and wet, and Autumn and the Earth are cold and dry." Proserpina, the goddess of winter, is a close friend of the god of water, Neptune, and so Winter and Water belong together. The Air of Spring shows up the glowing colours of flowers in blossom. Summer and Fire both share a common star as their point of reference - the sun, while Earth and Autumn share the moon. The correspondences between Arcimboldo's heads in profile -Autumn and Earth, Water and Winter - suggest that they can be interpreted as dialogues between the Elements and the Seasons. These dialogues, according to Fonteo, serve to glorify the Hapsburg Emperor. "advertisement" for the policies of the House of Hapsburg. Thus it was possible to maintain old links and to establish new ones - though probably not always to the unsullied delight of the recipients. However, it is difficult to imagine exactly how much of Arcimboldo's artistic activity was influenced by this sociological, utilitarian aspect of his art. Arcimboldo's paintings, which have been interpreted mainly in terms of the history of human thought, have been subject to a good deal of discussion and have therefore given rise to a considerable variety of approaches and ideas. The artist's cultural background, i. e. his immediate environment at the Emperor's court should be noted. The Art and Wonder Chambers, in particular, with their numerous rare species and collector's items, must have influenced Arcimboldo quite considerably. There was always a large number of stuffed animals among them - documentary evidence of an approach to natural science that was as yet rather unsystematic. Even at the Emperor's court, a considerable portion of educated society consisted of alchemists and magicians, thus showing that the distinction between the arts and sciences was not as clear-cut as it is today. Indeed, it was by no means rare for an artist to take an interest in "nature study" and in contemporary technology, as did Leonardo da Vinci and also Arcimboldo. It is impossible to list all the aquatic animals that make up this head, which is an allegory of the element water. The upper part of the body appears to be formed by a coat of arms consisting of a giant crab (the breastplate), a turtle and a large mussel (the shoulder-piece) to which an octopus has attached itself with its tentacles. The neck is decorated by a pearl necklace. The cheek is a ray, and an oddly shaped pearl decorates the mussel-like ear. A squill, another member of the crab family, takes the place of the eyebrows, and the mouth is formed by that of a shark, wide agape and with sharp teeth. The top part of the head is rounded off by some kind of crown, which seems to include one or two whales, two spout fish, a walrus, a young seal, a sea horse and, somewhat hidden from view, the arms of a starfish. The impression of a crown is re-inforced by the presence of long spikes coming out of a fish's spine and crown-shaped coral next to the spout fish. As in the other pictures, the individual animals are painted extremely realistically, though without regard to their respective sizes. The impression of chaos and confusion is only superficial; it does not take long to discern the apparent harmony which underlies this host of very diverse animals, some of which are indeed enemies of one another. Their peacefulness, too, is deceptive. The crown-like formation of animals, the harmony among them and the presence of the pearl necklace make this depiction of the element water a panegyric in honour of Maximilian. There are a number of paintings in which the artist depicts the Emperor as the lord and master of the elements and the seasons. It is only because of his benevolent rule that they and the people can live in peace and harmony. 1527 Birth of Giuseppe Arcimboldo in Milan. His mother's name is Chiara Parisi. His father is Biagio Arcimboldo, a painter. Birth of Maximilian II. 1549 24 December: first mention of Arcimboldo's name in the register of the workshop at Milan Cathedral, where he is working as one of his father's assistants. 1552 Birth of Rudolph II, son of Maximilian II. 1558 Arcimboldo finishes his work at Milan Cathedral. Designs for a gobelin tapestry for Como Cathedral. 1562 Arcimboldo moves to Vienna, where he is appointed to the court as a portrait artist and copyist. Maximilian is crowned King of Bohemia and of the Roman Empire. 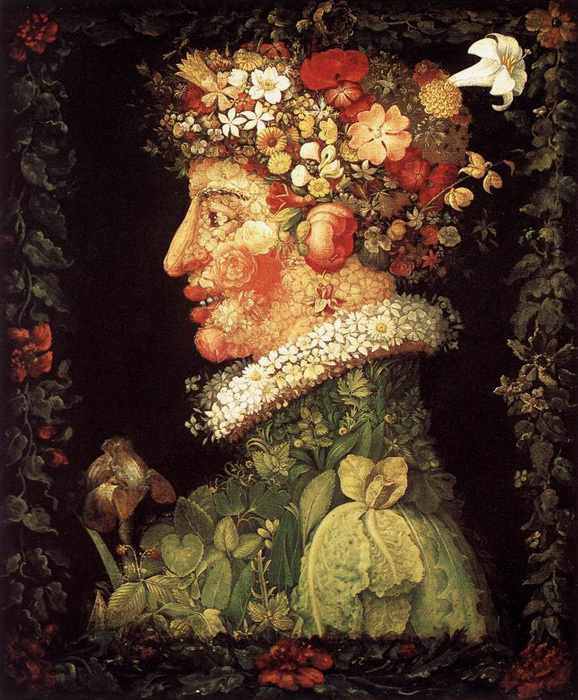 1563 Arcimboldo paints his first series of Seasons. 1564 Maximilian becomes Holy Roman Emperor. 1565 Arcimboldo is named in the Imperial court register as the court taker of likenesses. 1566 Arcimboldo paints The Lawyer and begins his series of The Four Elements. Travels to Italy. 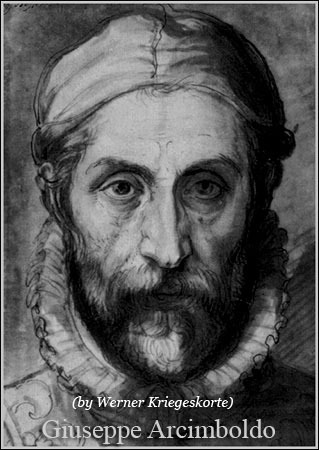 1568 Giambattista Fonteo becomes Arcimboldo's assistant. 1569 Maximilian is given the Seasons and Four Elements at New Year. Arcimboldo and Fonteo write a poem to accompany the paintings. 1570 Maximilian II's daughter Elizabeth marries Charles IX of France and a grand festival is put on in Prague. Arcimboldo is one of the organizers and participants. 1571 Archduke Charles of Austria marries Maria of Bavaria in Vienna, and Arcimboldo, together with Fonteo and Jacopo Strada, takes charge of the organization. 1572 Copies of the Seasons. 1573 Arcimboldo paints the third and fourth versions of the Seasons, which Maximilian II has ordered as a gift of homage to the Prince Elector of Saxony. 1575 Rudolph II is crowned King of Bohemia in Prague, and shortly afterwards King of the Roman Empire in Regensburg. 1576 Death of Emperor Maximilian II, Rudolph II becomes Emperor. 1580 Rudolph II ennobles the Arcimboldo family. 1584 G. Lomazzo's commentary on Arcimboldo, the first on the artist, is published in Lomazzo's Trattato dell' Antichita della Pittura. 1585 Arcimboldo makes Rudolph II a present of 148 designs for costumes, headgear and decorative wear. 1587 Arcimboldo leaves Prague and goes to Milan. The Emperor gives the artist 1550 guilders in recognition of his services. 1589 Arcimboldo sends his Flora from Milan to Prague. It is accompanied by a poem by Gregorio Comanini. 1591 Comanini publishes Il Figino in Mantua. Arcimboldo's portrait of Rudolph II as Vertumnus is sent to Prague with a poem by Comanini. 1592 Paolo Morigia's Historia dell' Antichita di Milano is published in Venice. 1593 Giuseppe Arcimboldo dies in Milan.